Diving for answers: what's happened to Dubai Pearl? Diving for answers: what’s happened to Dubai Pearl? It has been described as “sad”, “troubled” and “fallen” but for thousands of investors, discussion of the $6bn Dubai Pearl scheme provokes far less sympathetic language. The huge mixed-use project, announced in 2002, has been beset by delays and management changes, and lain dormant since construction work ground to a halt in 2006. A decade later, the project — 13 percent complete, according to its website — looms as a blot on Dubai’s skyline; an exposed concrete core with rusted steel framework; and, until recently, motionless cranes rising from the top of its skeletal structure. Last month, eyewitnesses claimed on Twitter that the last crane had been dismantled from the site. It was yet another blow to hundreds of investors that have repeatedly tried and failed to extract information from the authorities on what is happening with the scheme and whether they will ever recoup the millions of dirhams they put into it. Investors are at their wits’ end and fear the time will never be right. Arabian Business has learned the developer is close to agreeing to a deal with a landowner to take over the scheme. This could finally provide clarity to stakeholders as to the future of the Dubai Pearl. However, given the track record of the scheme’s decision-makers, with at least three major deals collapsing over the years and top UAE lawyer, Essam Al Tamimi, founder of Al Tamimi & Co, describing the project as “haunted”, there seems little reason to be hopeful. At 22 million sq ft, Dubai Pearl was touted as one of the largest construction projects in the world when developer Omnix Holdings started work on it in 2004. Occupying a prime location overlooking the Palm Jumeirah, between Dubai Media City and Knowledge Village, the masterplan aimed to create a “city within a city”, comprising four 79-storey towers based around a large podium, complete with 1,500 apartments, seven five-star hotels, 60 restaurants, offices, shops and a 1,600-seat theatre. It was originally scheduled for completion in 2006. The story is by now well known within the business community. After years of inactivity, a consortium led by Abu Dhabi-based Al Fahim Group bought the site in December 2007 and tweaked the design. The scheme was to be financed by off-plan sales and funds provided by the Al Fahim family and others. Meanwhile, the investment arm of Dubai International Financial Centre (DIFC) promised to buy $800m of space within the project. 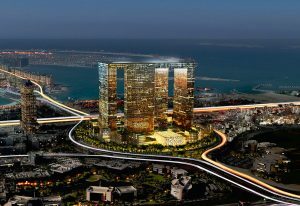 Dubai Pearl’s masterplan consists of four 73-storey towers connected at the summit. 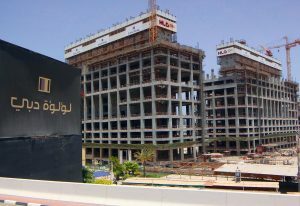 Work was due to restart in 2008, led by the delivery vehicle Pearl Dubai FZ and Habtoor Leighton Group as main contractor. However, as Dubai’s property market floundered in the wake of the economic downturn, activity only appeared to recommence in 2010, with developers claiming handover would begin in 2012. But very little construction work took place in the ensuing three years. Then, in 2011, DIFC Investments pulled out, having spent just $13m. The news was calamitous for the developer. In an email exchange with Arabian Business in November 2014, a former engineer with Pearl Dubai FZ recalled the day the deal with DIFC Investments collapsed. 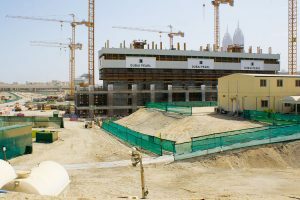 “Everything came crashing down in late 2008 but the Pearl had a miracle delivered to its front door — the DIFC said later it would invest $1-$2bn in the Pearl, as it would be the ‘pinnacle’ of Dubai,” the former engineer wrote. “Several of us stayed in Dubai over Christmas to assist and monitor EY & Deloitte in performing their due diligence. The outcome was spectacular as the consultants for DIFC Investments said they had approved the asset investment plan. In 2014, there was a glimmer of hope. Hong Kong-based Chow Tai Fook Endowment Industry Investment Development (CTFE) reportedly bought a $1.9bn slice in the project, prompting Pearl Dubai FZ to promise work would restart later that year. ‘Tai Fook’ translates as ‘big luck’ — something Dubai Pearl appears not to have enjoyed to date. Sources reported in 2014 that work did restart in the second quarter, but soon stalled. There were also rumours that the project had been refinanced via a debt-to-equity swap. A new completion date of 2018 was stated on the project website and the developer announced tie-ups with luxury hospitality brands including Baccarat, Bellagio, MGM Grand and Skylofts. However, the cranes remained largely still. Arabian Business understands Pearl Dubai FZ was making efforts last year to secure new financing for the project, with president and CEO Santhosh Joseph travelling to the US and Canada to hold talks with pension funds and other institutional investors. In November 2015, a Canadian investment firm called Canada Business Holdings announced its intention to spend up to $6bn on distressed real estate projects in Dubai, and added that it had expressed an interest in acquiring the Pearl. But there was no further news. This year, repeated requests by Arabian Business for information and updates have gone unanswered or met with the same, unsatisfactory response. In the past three months a more emphatic tone has been taken, with Dubai Pearl press officers and Joseph himself stating in emails that “it has been decided to decline all media requests”. The full statement said: “We understand you have been waiting for an update on the Dubai Pearl project and as we have advised on several occasions, we are happy to work with you on your story when we are in a position to do so. Dubai Pearl construction site as it stands today. “After discussions with top management and external third parties involved with the project, it has been decided to decline all media inquiries until further notice as we have in-confidence agreements in place and strategically, the timing is still inappropriate for us to disclose any information, whether partial or full about the project status. 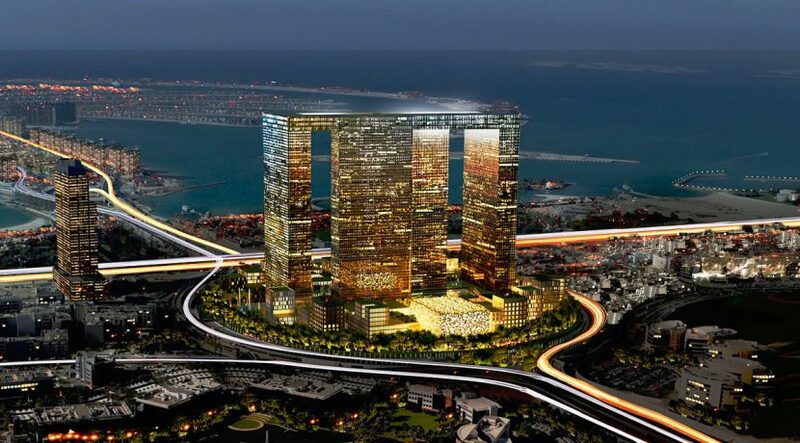 “Dubai Pearl, being a massive project, has several parties involved which would require necessary approvals for any public statements released from our side and unfortunately it is not possible for us to partake at this point in time. To say it is refusing all enquiries is an unusual move by a developer of such a high profile project, and investors are furious. Many have sought to bypass Pearl Dubai FZ altogether, approaching the Dubai Land Department (DLD) for answers. These investors claim they have been told the project is under “notice of cancellation” by the Dubai government but has yet to be officially cancelled, and that the developer is looking to find a new investor. DLD did not respond to Arabian Business’ requests for comment. Other investors have legal cases lodged with Dubai Courts in an attempt to recoup losses. Another anonymous investor says: “The last I heard four months ago was that they are trying to find a new developer, who will make some sort of offer to us. It’s depressing as we have already paid 50 percent of the total cost and wanted to move in over ten years ago, yet there has been no progress. Another investor was told something different: “I visited RERA [Dubai’s Real Estate Regulatory Agency, part of DLD] on my last trip to Dubai in November 2014 and they told me the project has been cancelled and re-registered and in case of no progress, the [landowner] will take back the land and whatever is on it. “I also visited the Pearl Dubai FZ’s office and met with them, they told me there are so many lawsuits but they do not have the money to pay the investors back or complete the project; they literally told me, you are stuck and no one knows what will happen. The Dubai Pearl development was designed to provide homes for an estimated 29,000 people. The lack of communication is wearing down investors. They clamour for some authoritative guidance on their rights and the remaining options available to them. All of that is unclear while the status of the project is unknown. The investor says he was told by the developer in 2014 that the company did not have the funds to return his money. A Pearl Dubai FZ employee revealed to him at the time that he had not been paid for three months and was planning to quit. “The latest update I received from the developer was last week when I sent them a request to update my address and provide me with a new status for the scheme. “Their response was they are still searching for an investor — the same excuse for the last decade. Australian investor Stefanovski says all her attempts to find out what has happened to this “sad” project have led to a “dead end”. Meaningful communication with the developer dried up in 2013, she says, while interactions with the DLD have proved futile, with officials telling her she “must be patient and call again later this year”. In an interview with Arabian Business last December, Essam Al Tamimi said the Dubai Pearl appears to be “haunted”. “It has moved from owner to owner over the past 12 years and every time the project starts to move, some other complication happens,” he said. Investors bought property based on impressive marketing literature. He explained it is now illegal to sell off-plan unless the investment is secured in a third party-managed escrow account until the project is complete, instead of handing the money upfront to the developer. Off-plan investors today can take reassurance from this, he said. But this is of little comfort to Pearl investors, who put their hard-earned cash in what was one of the most exciting off-plan schemes of the time and have had to watch it crumble to dust along with their money and their dreams. “In 2004 I agreed to purchase five floors in one of the towers, with total value amounting to AED80.36m ($21.8m) and completion date in first quarter of 2007. 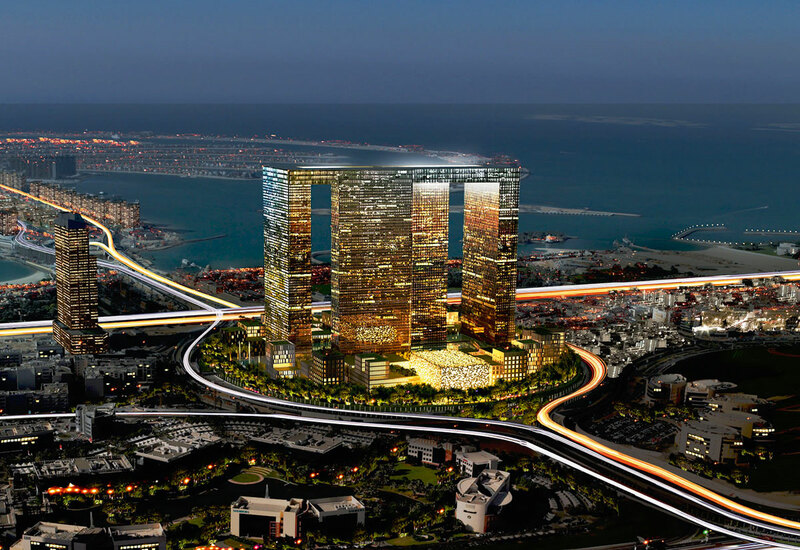 “The Dubai Pearl was a dream project for me and many other investors. But after two years of seeing no progress I paid AED5.49m and stopped all other payments. I also cancelled my old agreement and amended the purchase to just one floor. “In August 2006, the developer called us into its office and promised they were working very hard to finish the job. They refused our proposal for a refund and asked us to sign a new sales agreement stating a revised completion date of February 2009. “In December , I received a letter from the developer requesting my consent to change the scheme’s ownership to Pearl Dubai FZ. I immediately started negotiating with the new developer over my right to a refund and met Santhosh Joseph and Abul Majeed Al Fahim in February 2007. “They told me they could not give me any information nor refund my money. I was offered a new agreement with revised payment schedule and completion date of 2011, but I refused and insisted on a refund. “Finally, they came back to me with a letter in November, 2008 agreeing to refund the original amount I had paid to them but by the time we agreed on that amount they changed their mind. They promised the development would be complete by the end of 2011; this was later extended to 2013 and again to the end of 2015, now maybe never. “In late 2014 my mother met with Pearl Dubai FZ and they promised to refund us in three payments over six months but refused to sign a formal agreement. “Sadly, my mother passed away due to cancer in January 2016 — in part because I could not afford to provide her with best medical treatment due to my loss of resources and I hold [Dubai Pearl] responsible in this world and hereafter.